Benjamin F. Strickland II, is a retired U.S. Coast Guard Commander (CDR) and a native of Issaquah, Washington. He graduated from Maine Maritime Academy in 1995 and holds an active merchant marine license as a 200 ton Master and Unlimited tonnage Deck Officer. He attended the U.S. Naval War College in 2009 graduating with a Masters of Arts degree in National Security and Strategic Studies. He is a graduate of the Maritime Advanced Warfighting School (MAWS) and is a qualified Joint Operational Planner. CDR Strickland enlisted in the U.S. Naval Reserve in 1992. He was commissioned an Ensign upon graduation from Maine Maritime Academy in 1995 and served three years active duty in the regular Navy. His initial assignment at sea was in USS Hopper (DDG-70) at Pearl Harbor, Hawaii where he qualified as a Surface Warfare Officer while serving as Electronic Warfare Officer, and later First Lieutenant. In 1998, CDR Strickland transferred to the Coast Guard where he was assigned to Marine Safety Office Puget Sound in Seattle, Washington. There he qualified as a Senior Marine Inspector, enforcing US and International maritime regulations and safety standards for foreign and domestic vessels. He also served as the unit Special Interest Vessel (SIV) Officer, supervising the tracking and reporting of high-interest shipping for national intelligence agencies. In 2000 he returned to sea duty as Weapons Officer in USCGC Sherman (WHEC-720) at Alameda, California, completing patrols in the Bering Sea and Eastern Pacific. SHERMAN also deployed to the Persian Gulf, serving as Surface Action Group (SAG) Commander for Middle East Force 01-1 and Maritime Interdiction Operations Coordinator (XJ) for the USS Harry S Truman Battlegroup. In theatre as a Tactical Action Officer (TAO), CDR Strickland coordinated maritime enforcement of UN sanctions against Iraq and air surveillance operations in support of Operation Southern Watch. Upon leaving the Fifth Fleet area of operations, Sherman transited home to Alameda via circumnavigation of the world. In 2002, CDR Strickland was assigned as Coast Guard Liaison Officer at Afloat Training Group Pacific Northwest in Everett, Washington. There he qualified as an Afloat Training Specialist, managing the training, assessment and certification for three different classes of cutters as the Pacific Area Commander’s direct representative. 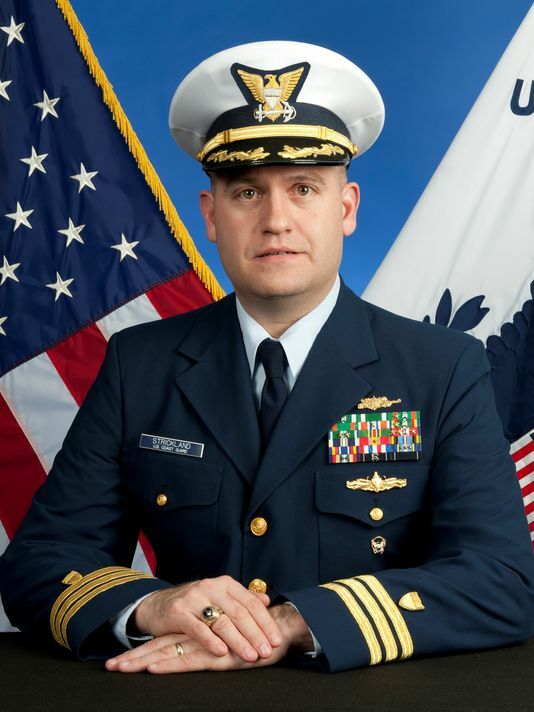 From 2004 to 2006, he served as Operations Officer in USCGC Midgett (WHEC-726) at Seattle, Washington, coordinating Homeland Security, Search and Rescue, Fisheries and Counter-Drug missions throughout the Pacific in support of Operations NOBLE EAGLE, ARCTIC SAFEGUARD, BERING SHIELD and CAPER FOCUS. CDR Strickland commanded USCGC Roanoke Island (WPB-1346) at Homer, Alaska from 2006 to 2008 before attending the College of Command and Staff and Maritime Advanced Warfighting School at Naval War College in Newport, Rhode Island. He then performed a three month operational warfare assignment comprising contingency, adaptive and collaborative planning in the development of a formal Concept Plan (CONPLAN) for U.S. Naval Forces Central Command and Operation Enduring Freedom. From 2009 to 2011, he was assigned as a Strategic Planner in the Office of Counterterrorism and Defense Operations (CG-532) at Coast Guard Headquarters in Washington, DC where he executed responsibility for Coast Guard input into National Defense strategy documents, plans and policy, coordination of service chief-level staff talks, resourcing of Joint Staff global force management requests, and also served as the Desk Officer for all U.S. European Command and U.S. Africa Command issues. CDR Strickland returned to sea as Operations Officer in USCGC Stratton (WMSL-752) at Alameda, California from July 2011 to June 2012 before assuming duties as Executive Officer in USCGC Munro (WHEC-724) at Kodiak, Alaska in July 2012. In 2014, he was reassigned to Coast Guard Headquarters as the Support Division Chief in the Office of Counterterrorism and Defense Operations. He retired from active duty in October, 2015. After his retirement from active duty, CDR Strickland accepted a civilian position in the maritime industry where he specializes in Strategic Sealift, Port Security and National Security affairs. CDR Strickland’s decorations include the Coast Guard Commendation Medal (3 awards), Navy Commendation Medal, Coast Guard Achievement Medal (3 awards), and Navy Achievement Medal as well as various unit, service, and campaign awards and commendations. Additionally he has earned permanent designators as a Coast Guard Cutterman, Surface Warfare Officer and Special Duty Officer (Merchant Marine, Deck).